For other uses, see John Curtin (disambiguation). 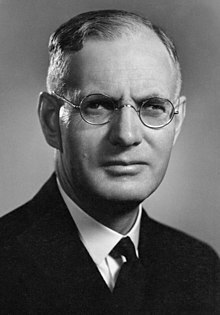 John Curtin (8 January 1885 – 5 July 1945) was an Australian politician who served as the 14th Prime Minister of Australia, in office from 1941 until his death in 1945. He led the country for the majority of World War II, including all but the last few weeks of the war in the Pacific. He was the only Australian prime minister to come from Western Australia, and was the longest serving leader of the Australian Labor Party until Gough Whitlam. Curtin left school at the age of 13 and became involved in the labour movement in Melbourne. He joined the Labor Party at a young age and was also involved with the Victorian Socialist Party. He became state secretary of the Timberworkers' Union in 1911 and federal president in 1914. Curtin was a leader of the "No" campaign during the 1916 referendum on overseas conscription, and was briefly gaoled for refusing to attend a compulsory medical examination. He moved to Perth the following year to become the editor of the Westralian Worker, and later served as state president of the Australian Journalists' Association. After three previous attempts, Curtin was elected to the House of Representatives at the 1928 federal election, winning the Division of Fremantle. He remained loyal to the Labor government during the party split of 1931. He lost his seat in Labor’s landslide defeat at the 1931 election, but won it back in 1934. The following year, Curtin was elected party leader in place of James Scullin, defeating Frank Forde by a single vote. The party gained seats at the 1937 and 1940 elections, with the latter resulting in a hung parliament. The ALP eventually formed a minority government in October 1941, when the Fadden Government lost a confidence motion. The Japanese attack on Pearl Harbor occurred two months after Curtin became prime minister, and Australia entered the war with Japan. Bombing raids on northern Australia soon followed. Curtin led the nation's war effort and made significant decisions about how the war was conducted. He placed Australian forces under the command of the American general Douglas MacArthur, with whom he formed a close relationship, and successfully negotiated the issue of overseas conscription that had split his party during World War I. The ALP won almost two-thirds of the seats in the House of Representatives at the 1943 election, which remains a party record. Curtin died in office in July 1945, after months of ill health attributed to the stresses of the war. Many of his post-war reconstruction plans were implemented by his successor Ben Chifley, who in 1946 led the ALP to consecutive victories for the first time. Curtin's leadership skills and personal character were acclaimed by his political contemporaries. He is frequently cited as one of Australia's greatest prime ministers, and is held in particularly high regard by the Labor Party. John Curtin was born in Creswick, Victoria, on 8 January 1885. He was christened "John Joseph Ambrose", although his middle names were not recorded on his birth certificate and he stopped using them in later life. Within his family he was known as "Jack". Curtin was the oldest of four children – his younger brother George was born in 1887, followed by his younger sisters Molly and Hannah in 1889 and 1891. His parents were both born in County Cork, Ireland. His father, John Curtin Sr., had arrived in South Australia in 1873, with two of his brothers. His brothers settled in Adelaide, but he moved on to Victoria and found work as a warder at Pentridge Prison. He later joined the Victoria Police, wherein thirteen years he never rose above the rank of a constable; he received reprimands for indecent assault and using excessive force against children. In 1883, he married Catherine Agnes Bourke (known as "Kate"), who had arrived in Melbourne in 1875. She was the sister of one of his police colleagues. Curtin was born with congenital strabismus of the left eye, which remained noticeable throughout his life. It was largely a cosmetic defect, but he was quite self-conscious about it. According to his biographer David Day, it had "a considerable psychological effect" on him, and likely exacerbated his natural shyness. Curtin lived in Creswick until 1890, when his father retired from the police. His father suffered from chronic rheumatoid arthritis and syphilis, and was assessed as medically unable to resume his police duties. He was offered a choice between an annual pension and a lump-sum pay-out, and opted for the latter. He subsequently moved his family to inner Melbourne, taking over the lease of a pub on Little Lonsdale Street and moving into rented accommodation in Brunswick. Curtin began his education at St Francis' Boys School, a Christian Brothers school attached to St Francis' Church. He later briefly attended St Bridget's School in Fitzroy. He also attended Macedon Primary School in Macedon. In 1894, Curtin and his family moved to Charlton, a small country town in north-west Victoria. His father had failed to prosper in Melbourne, which was in the middle of an economic downturn. In Charlton, he took over the lease of a pub owned by his brother-in-law, John Bourke. Curtin was enrolled in the local state school, as a Catholic school had not yet been established. He excelled academically, and was seen as a potential "scholarship boy". [b] However, he and his family left Charlton in 1896. Struggling financially, they spent the following two years moving around country Victoria, as his father managed pubs in Dromana, Drouin, and Mount Macedon. Curtin attended the local state schools, ending his formal education in 1898 at the age of 13. In early 1899, Curtin began working as an office boy at a weekly magazine called The Rambler, earning five shillings per week. His employer was the artist and writer Norman Lindsay, who had also grown up in Creswick and knew his family. [c] The magazine did not last long, and over the following years Curtin held down a series of short-term jobs, including as a copy boy at The Age, a potter's apprentice, and a houseboy at a gentlemen's club. These were interspersed with periods of unemployment. He did not secure a permanent job until he was 18, taking up a position as an estimates clerk with the Titan Manufacturing Company in South Melbourne in September 1903. By that time he was the family's primary breadwinner, as his father was a virtual invalid. As a youth, Curtin was a talented sportsman. Between 1903 and 1907, he played as a half-forward flanker for the Brunswick Football Club in the semi-professional Victorian Football Association (VFA). His teammates gave him the nickname "Bumble". His nephew Claude played for Fitzroy in the Victorian Football League (VFL). Curtin also played cricket for the Brunswick Cricket Club, where he had a reputation as a solid batsman. He remained involved in both sports throughout the remainder of his life, as an administrator and supporter. He was said to have an encyclopaedic knowledge of cricket statistics. From a young age, Curtin was active in both the Australian Labor Party and the Victorian Socialist Party, which was a Marxist organisation. He wrote for radical and socialist newspapers. From 1911 until 1915, Curtin was employed as state secretary of the Timberworkers' Union. He was elected federal president of the union in 1914. During World War I he was a militant anti-conscriptionist; he was briefly imprisoned in December 1916 for refusing to attend a compulsory medical examination, even though he knew he would fail the exam due to his very poor eyesight. He also stood (unsuccessfully) as the Labor candidate for Balaclava in the 1914 federal election. The strain of this period led him to drink heavily and regularly, a vice which blighted his career for many years. He proposed to Elsie Needham, the sister of Labor Senator Ted Needham, on St Kilda Beach, and they were married on 21 April 1917 in the dining room of private home in West Leederville. Curtin moved to Perth, Western Australia, in 1917 to become an editor for the Westralian Worker, the official trade union newspaper. He settled in the suburb of Cottesloe where his residence is now heritage-listed as "John Curtin's House". He enjoyed the less pressured life of Western Australia and his political views gradually moderated. He joined the Australian Journalists' Association (AJA) in 1917 and was elected its Western Australian President in 1920. He wore his AJA badge (WA membership #56) every day he was prime minister. In addition to his stance on labour rights, Curtin was also a strong advocate for the rights of women and children. In 1927, the Federal Government convened a Royal Commission on Child Endowment, and Curtin was appointed as a member of that commission. Curtin stood for Parliament a second time in 1925, this time for Fremantle, although he lost heavily to the incumbent William Watson. Watson retired in 1928, and Curtin ran again, this time winning on the second count. Re-elected in Labor's sweeping election victory the following year, he expected to be named as a member of Prime Minister James Scullin's Cabinet, but disapproval of his heavy drinking habit meant that he remained on the backbench. William Watson chose to briefly come out of retirement in 1931, and easily defeated Curtin in an election that saw Labor collapse to just 14 seats in Parliament. After the loss, Curtin became the advocate for the Western Australian Government with the Commonwealth Grants Commission. He stood for his old seat in 1934 after Watson announced his retirement for the second time, and was able to win it back. When Scullin resigned as Labor Leader in 1935, Curtin stood in the election to replace him, although he was not expected to win. His opponent was Frank Forde, the deputy leader of the party since 1931 who had been closely associated with the economic policies of the Scullin Government. This led left wing factions and trade unions to support Curtin, in an attempt to block Forde from getting the leadership. With their support, Curtin was able to defeat Forde by just one vote to become Leader of the Labor Party and Leader of the Opposition. The groups that had supported Curtin did so on the basis that he promise to give up alcohol, which he subsequently did. Although Labor made little progress at the 1937 election, by 1939 Labor's position had vastly improved. Curtin led Labor to a five-seat swing in the 1940 election, which resulted in a hung parliament. In that election, Curtin's own seat of Fremantle had been in doubt. United Australia Party challenger Frederick Lee appeared to have won the seat on the second count after most of independent Guildford Clarke's preferences flowed to him, and it was not until the final counting of preferential votes that Curtin knew he had won the seat. In September 1939, the Second World War commenced when Nazi Germany invaded Poland. In line with the king's declaration of war, Prime Minister Robert Menzies declared war on Germany and announced Australia's support for the British war effort. In 1941, Menzies travelled to Britain to discuss Australia's role in the war strategy, and to express concern at the reliability of Singapore's defences, only to be drawn into Winston Churchill's disastrous Greek campaign. While he was in Britain, Menzies lost the support of his own party, and was forced to resign as prime minister. 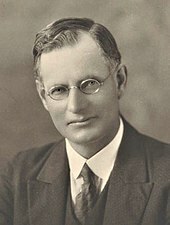 The Coalition elected Arthur Fadden, the leader of the Country Party, as Menzies' replacement, even though the UAP was the senior partner in the Coalition. Curtin adroitly refused calls from his own caucus to bring about the defeat of the government through a motion of no confidence. Curtin had refused Menzies' initial offer to form a wartime "national government", partly because he feared that it would split the Labor Party, although he did agree to join the Advisory War Council. In October 1941, Arthur Coles and Alexander Wilson, the two independent MPs who had been keeping the Coalition in office since 1940 (first under Menzies, then under Fadden), joined forces with Labor in defeating Fadden's budget and bringing the government down. Governor-General Lord Gowrie was reluctant to call an election for a Parliament barely a year old, especially given the international situation. He summoned Coles and Wilson and made them promise that if he named Curtin prime minister, they would support him for the remainder of the Parliament to end the instability in government. The independents agreed, and Curtin was sworn in as prime minister on 7 October, aged 56. He became the first and only prime minister to come from Western Australia. On 8 December 1941, the Pacific War broke out when Japan bombed Pearl Harbor. Curtin addressed the nation on the radio, saying, "Men and women of Australia...we are at war with Japan. This is the gravest hour of our history. We Australians have imperishable traditions. We shall maintain them. We shall vindicate them. We shall hold this country and keep it as a citadel for the British-speaking race and as a place where civilisation will persist." On 10 December, HMS Prince of Wales and HMS Repulse were both sunk by Japanese bombers off the Malayan coast. 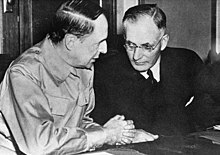 Curtin cabled the President of the United States, Franklin D. Roosevelt, and Churchill on 23 December, saying, "The fall of Singapore would mean the isolation of the Philippines, the fall of the Netherlands East Indies and attempts to smother all other bases. It is in your power to meet the situation... we would gladly accept United States commanders in the Pacific area. Please consider this as a matter of urgency." We look for a solid and impregnable barrier of the Democracies against the three Axis powers, and we refuse to accept the dictum that the Pacific struggle must be treated as a subordinate segment of the general conflict. By that it is not meant that any one of the other theatres of war is of less importance than the Pacific, but that Australia asks for a concerted plan evoking the greatest strength at the Democracies' disposal, determined upon hurling Japan back. The Australian Government, therefore regards the Pacific struggle as primarily one in which the United States and Australia must have the fullest say in the direction of the Democracies' fighting plan. Without any inhibitions of any kind, I make it clear that Australia looks to America, free of any pangs as to our traditional links or kinship with the United Kingdom. We know the problems that the United Kingdom faces. We know the dangers of dispersal of strength, but we know too, that Australia can go and Britain can still hold on. We are, therefore, determined that Australia shall not go, and we shall exert all our energies towards the shaping of a plan, with the United States as its keystone, which will give to our country some confidence of being able to hold out until the tide of battle swings against the enemy. This speech was one of the most important in Australia's history, marking a turning point in Australia's relationship with its founding country, the United Kingdom. Many felt that Prime Minister Curtin was abandoning Australia's traditional ties to the British Isles without any solid partnership in place with the United States. This speech also received criticism at high levels of government in Australia, Britain and the US; it angered Churchill, and Roosevelt said that it "smacked of panic". The speech nevertheless achieved the effect of drawing attention to the possibility that Australia would be invaded by Japan. Before this speech, the Australian response to the war effort had been troubled by attitudes swinging from "she'll be right" to gossip-driven panic. By 1943, when the threat of Japanese invasion had passed, Curtin increasingly returned to a commitment to the British Empire. Downplaying nationalism, he said that Australia comprised "seven million Britishers." He saw the United States as a predatory economic and military power that would threaten Australia's own ambitions in the Pacific. Australia moved closer to New Zealand, and suggested a lesser role for the United States after the war. Washington was annoyed. Concurrently, the Curtin government enacted the Statute of Westminster Adoption Act 1942, under which Australia accepted the dominion status which Britain had conferred in 1930, but which the Australian federal government had not accepted until then. The Adoption Act took effect retroactively as of 3 September 1939, the outbreak of World War II. Although politically a product of the government's policy of re-orientation towards the United States, constitutionally, this marked the moment that Australia became an independent nation with a separate Crown, no longer subject to the supremacy of British law and the British Crown. The Governor-General The Earl Gowrie signs the declaration of war against Japan, with Curtin looking on. The Curtin Government agreed that the Australian Army's I Corps – centred on the 6th and 7th Divisions – would be transferred from North Africa to the American-British-Dutch-Australian Command in the Netherlands East Indies for the defence of Java and Sumatra. Before they could arrive, Singapore fell on 15 February 1942. Most of the 8th Division was taken into captivity, although a small number, including its commander, Major General Gordon Bennett, managed to escape. "The fall of Singapore," Curtin announced in a radio address to the nation on 16 February, "can only be described as Australia's Dunkirk. It will be recalled that the fall of Dunkirk initiated the Battle for Britain. The fall of Singapore opens the Battle for Australia. On its issue depends not merely the fate of this Commonwealth but the frontier of the United States of America and, indeed, all the Americas and, therefore, in a large measure the fate of the British-speaking world." The Japanese threat was further underlined on 19 February, when Japan bombed Darwin, the first of many air raids on northern Australia. Churchill attempted to divert I Corps to reinforce British troops in Burma, without Australian approval. Curtin insisted that it return to Australia. Roosevelt supported Churchill, offering to send an American division to Australia instead, while the Chief of the General Staff Lieutenant General Vernon Sturdee, threaten to resign if his advice was ignored and the troops were diverted to Burma. Curtin prevailed, although he weakly agreed that the main body of the 6th Division could garrison Ceylon. In the 1943 Australian federal election campaign the following year, Curtin was forced to publicly defend his decision. "Had we held Rangoon, or had we even held the district, of Akyab", media magnate Keith Murdoch wrote in an editorial on 13 August 1943, "we would have held the door to the vast manpower of China and the jumping-off fields for the devastation of Japanese cities. Multitudes of the finest lives of Australia, Britain, and America would have been saved; the long years of toil, death, and separation, which assuredly stretch ahead, would have been shortened." A lesser Australian leader might have grated against MacArthur's vanity, cavilled at his assumption of command, contradicted his grandiloquent claims, satirised his manner. Curtin did not. He seized the chance to share authority with MacArthur, refused to offend his vanity, drew him as close as he could. Of Curtin's military decisions, it was the cleverest, most fruitful, most abidingly successful. By mid-1942, the results of the battles of the Coral Sea and Midway had averted the perceived threat of invasion. Despite the "beat Germany first" policy, 346,000 Americans were fighting in the Pacific in 1942. Curtin had previously opposed conscription for overseas service during World War I, and again in 1940 when it was introduced by Menzies, although he had supported softening it to allow conscripts to serve in Australian territories. Curtin recognised that the restriction of the Australian conscripts to Australia and its territories was morally indefensible and politically unviable. To remove what was now a major obstacle to the government's re-election prospects, he moved to remove the restriction. While there was support from the Communist Party of Australia and its sympathisers, there was trenchant opposition from the Catholic Church, represented by B. A. Santamaria and Arthur Calwell. Ultimately, the Defence Act was amended so that conscripts could be deployed outside of Australia to "such other territories in the South-West Pacific Area as the Governor-General proclaims as being territories associated with the defence of Australia". The stress of the war and especially this bitter internal battle within Labor took a great toll on Curtin's health, which had never been robust even at the best of times. He had suffered all of his life from stress-related illnesses, and depression; he was also a heavy smoker. Curtin made very heavy use of newspapers and broadcast media, especially through press conferences, speeches, and newsreels. Australians gained a sense it was a people's war in which they were full participants. Mackenzie King, the Prime Minister of Canada, hosting Prime Minister John Curtin of Australia and his wife Elsie at the Peace Tower in Ottawa. In terms of social policy, the Curtin Government enacted a wide range of progressive social reforms during its time in office. Pensions were introduced for deserted wives and widows, while the establishment of the Women's Employment Board led to increased wages for some women during the war. Aboriginal Australians were provided with significantly increased entitlement to welfare benefits, while maternity allowances were extended. In addition, pensions for the elderly and infirm were increased. In 1942, temporary public employees became eligible to apply to join the Commonwealth superannuation scheme if they had been employed for no less than five years and were certified as having indefinite future employment, while the Commonwealth Employees' Furlough Act of 1943 provided long service leave for all temporary Commonwealth employees. In 1943, the Universities Commission was established to exempt students from war service to undertake or continue university studies and to assist those students by exempting them from fees and, subject to a means test, by providing them with living allowances. "Asiatics" who were British subjects became eligible for a pension in 1941, and eligibility was extended the following year to Pacific Islanders known as "Kanakas", and from that July that year "Aboriginal natives" of Australia became eligible for pensions if they were not subject to a state law "relating to the control of Aboriginal natives" or if they lived in a state where they could not be exempt from such laws but were of eligible for pension on the grounds of "character, standard of intelligence and development". That same year, pension became exempt from income tax. In 1943, funeral benefits were introduced, together with a Wife's Allowance for wives of incapacitated age pensioners "where she lived with him, was his legal wife and did not receive a pension in her own right." From June 1942, Widows' Pension Class B was paid to widows without dependent children who were aged 50 and over. The term "widow" included de facto widows who had lived with the deceased spouse for at least three years prior to his death and had been maintained by him. Eligibility was also extended to deserted de jure wives who had been deserted for at least six months, divorced women who had not remarried and women whose husbands were in hospitals for those considered to be insane. From July that year, Widows' Pension Class B (WPb) was exempted from income tax. In 1942, eligibility for maternity allowances was extended to Aboriginal women who were exempted from State laws relating to the control of Aboriginal natives and who were considered suitable to receive the benefits. From 1943, the income test for maternity allowances was abolished and the rate of the allowance was increased to 15 pounds where there were no other children under the age of 14 years, 16 pounds where there were one or two other children, and 17 pounds 10 shillings in cases of three or more children. These amounts included an additional allowance of 25 shillings per week in respect of the period four weeks before and four weeks after the birth, to be paid after the birth of the child. That same year, eligibility for Child Endowment was extended to children in Government institutions, to Aboriginal children who lived for six months per year on a mission station, and to children who were maintained from a deceased estate. The Child's Allowance was introduced in 1943, payable at the rate of five shillings per week for a first for an unendowed child under 16 years dependent on an invalid or permanently incapacitated old-age pensioner. From July 1945 onwards, Additional Benefit for Children of five shillings per week became payable in respect of the first child to any person qualified to receive unemployment or sickness benefit having the custody, care and control of one or more children under the age of 16. Even allowing for the advantages that an incumbent government has in wartime, Curtin went into the 1943 election in a very strong position. The Coalition had become almost moribund by this time, and Fadden and Hughes had been unable to get the better of Curtin. In the election, Curtin led Labor to its greatest-ever victory, winning two-thirds of the seats in the House of Representatives on a two-party preferred vote of 58.2% and a 17-seat swing. The Coalition was reduced to only 19 seats nationwide, including only seven for Fadden's Country Party. Labor also won the primary vote in all states in the Senate, and thus all 19 seats, to hold a majority of 22 out of 36 seats. Buoyed by this success, Curtin called a referendum which would give the government control of the economy and resources for five years after the war was over. The 1944 Australian Referendum contained one referendum question: "Do you approve of the proposed law for the alteration of the Constitution entitled 'Constitution Alteration (Post-War Reconstruction and Democratic Rights) 1944'?" Constitution Alteration (Post-War Reconstruction and Democratic Rights) 1944 was known as the 14 powers, or 14 points referendum. It sought to give the government power, over a period of five years, to legislate on monopolies, corporations, trusts, national health, family allowances, freedom of speech, religion, ex-servicemen rehabilitation, the ability to legislate for Indigenous Australians, and safeguards against the abuse of legislative power. The referendum was defeated, receiving a majority only in Western Australia and South Australia. Nationally overall, 54 percent voted against the question in the referendum. By 1944, a time when he was travelling to and from London and Washington for meetings with Churchill, Roosevelt and other Allied leaders, Curtin had already developed heart disease. He had a heart attack in November 1944, and did not return to work until January 1945. With the end of the war in sight, his health began to deteriorate seriously and at a rapid pace. On 5 July 1945, Curtin died at The Lodge at the age of 60. He was the second Australian prime minister to die in office within six years. A Catholic priest called at The Lodge as Curtin lay dying, but he was turned away. Curtin had refused to so much as set foot inside a Catholic church throughout his adult life, not even to attend the weddings of friends. His body was returned to Perth on a RAAF Dakota escorted by a flight of nine fighter aircraft. After lying in state, he was buried at Karrakatta Cemetery in Perth; the service was attended by over 30,000 at the cemetery with many more lining the streets. Curtin was initially succeeded as prime minister by his deputy, Frank Forde; seven days later a party ballot installed Ben Chifley as Labor Leader and therefore prime minister. Many of Curtin's post-war reconstruction plans were implemented by his successor Chifley, who in 1946 led the ALP to consecutive victories for the first time. Curtin's 9 years and 277 days as leader of the federal ALP would remain a record until it was surpassed by Gough Whitlam in 1976. MacArthur said of Curtin that "he was one of the greatest of wartime statesmen, and the preservation of Australia from invasion will be his immemorial monument". Curtin is credited with leading the Labor Party to its best federal election success in history, with a record 55.1 percent of the primary half-senate vote, winning all seats, and a two party preferred lower house estimate of 58.2 percent at the 1943 election, winning two-thirds of seats. Australia entered World War II with only a fragmentary welfare provision: by the end of the war it had constructed a "welfare state". Curtin reinforced the White Australia policy in a speech in which he stated: "This country shall remain forever the home of the descendants of those people who came here in peace in order to establish in the South Seas an outpost of the British race." John Curtin statue at Fremantle Town Hall. The Curtin government's October 1942 enactment of the Statute of Westminster Adoption Act 1942, reversing the stance of four previous governments, marked the moment of Australia's legal independence. This law, along with the Constitution of Australia and the Australia Act 1986, is one of the key components of Australia's modern constitutional framework. His early death and the sentiments it aroused have given Curtin a unique place in Australian political history. Successive Labor leaders, particularly Bob Hawke and Kim Beazley, have sought to build on the Curtin tradition of "patriotic Laborism". Even some political conservatives pay at least formal homage to the Curtin legend. Immediately after his death the parliament agreed to pay John Curtin's wife Elsie a £1,000 per annum pension until legislation was passed and enacted to pay a pension to a past prime minister or their widow after their death. Curtin is commemorated by the federal seat of Curtin, the Canberra suburb of Curtin, Curtin University in Perth, John Curtin College of the Arts in Fremantle, the John Curtin School of Medical Research in Canberra, the John Curtin Prime Ministerial Library, Curtin Springs in the Northern Territory, John Curtin House, the former headquarters of the Australian Labor Party, Curtin House in Swanston Street, Melbourne, and many other buildings, roads, parks and structures throughout Australia. In 1975 Curtin was honoured on a postage stamp bearing his portrait issued by Australia Post. On 14 August 2005, the 60th anniversary of V-P Day, a bronze statue of Curtin in front of Fremantle Town Hall was unveiled by Premier of Western Australia Geoff Gallop. John Curtin features in the Paradox Interactive game Hearts of Iron IV as the leader of Australia. Depending on the players choices he can stay in power or be ousted by another political group. Curtin also features as the leader of Australia in Firaxis Games title Civilisation 6. ^ Curtin's title was Minister for Defence Co-ordination until 21 September 1943, at which point it was changed to simply Minister for Defence. ^ At the time, the Victorian government did not maintain its own system of secondary schools. Children from families who could not afford private school fees could only receive a secondary education if they won a scholarship – usually after ranking highly in a particular examination. A number of writers have compared Curtin's experiences with those of Robert Menzies, who also received his initial schooling at small state schools in country Victoria. Menzies came from a more stable family environment, and by winning a series of scholarships was able to attend an elite private school and eventually study law at the University of Melbourne. In contrast, it is unclear if Curtin was ever given the opportunity to sit a scholarship examination. ^ Norman Lindsay's father, Robert Lindsay, had been the attending doctor at Curtin's birth. ^ a b Day 1999, p. 15. ^ Day 1999, p. 16. ^ Day 1999, p. 3. ^ Day 1999, p. 4. ^ Day 1999, p. 14. ^ Day 1999, p. 31. ^ Day 1999, pp. 24–26. ^ Day 1999, p. 29. ^ Day 1999, p. 33. ^ Day 1999, p. 37. ^ Day 1999, pp. 42–44. ^ Day 1999, pp. 49–50. ^ Day 1999, p. 72. ^ "Bouncedown at Brunswick Football Club". John Curtin Prime Ministerial Library. Retrieved 26 May 2018. ^ "A great barracker: Curtin and footy". John Curtin Prime Ministerial Library. Retrieved 26 May 2018. ^ "A fine innings: Curtin and cricket". John Curtin Prime Ministerial Library. Retrieved 26 May 2018. ^ a b "Curtin WA's First Prime Minister". The Daily News (Home ed.). Perth: National Library of Australia. 5 July 1945. p. 14. Retrieved 19 August 2014. ^ "Biography of John Curtin". John Curtin Prime Ministerial Library. Retrieved 16 March 2019. ^ a b Serle, Geoffrey. "Curtin, John (1885–1945)". Australian Dictionary of Biography. Canberra: Australian National University. Retrieved 17 March 2019. ^ "Balaclave – Mr J. Curtin's Candidature". The Age (18541). Victoria, Australia. 22 August 1914. p. 14. Retrieved 23 March 2019 – via National Library of Australia. ^ "Metropolitan Electorates". The Age (18554). Victoria, Australia. 7 September 1914. p. 11. Retrieved 23 March 2019 – via National Library of Australia. ^ Edwards 2017, pp. 21–22. ^ "Biography of Elsie Curtin". Curtin University. Retrieved 23 March 2019. ^ "Perth Prattle". Sunday Times (Perth) (1008). Western Australia. 29 April 1917. p. 5 (Second Section). Retrieved 23 March 2019 – via National Library of Australia. ^ "Labor Women". Westralian Worker. Perth: National Library of Australia. 13 July 1945. p. 4. Retrieved 20 August 2014. ^ "Life in Politics". The West Australian. Perth: National Library of Australia. 6 July 1945. p. 8. Retrieved 20 August 2014. ^ "Curtin, The Man". The West Australian. Perth: National Library of Australia. 6 July 1945. p. 8. Retrieved 20 August 2014. ^ "Britain Declares War". The Courier-mail (1874). Queensland, Australia. 4 September 1939. p. 1. Retrieved 23 March 2019 – via National Library of Australia. ^ Edwards 2017, pp. 228–229. ^ Edwards 2017, pp. 258–261. ^ Edwards 2017, pp. 196–199. ^ Edwards 2017, pp. 264–267. ^ "John Curtin". Western Australian government. Retrieved 25 March 2019. ^ Hasluck 1970, p. 2. ^ "The Hinge of Fate". The Courier-mail (4332). Queensland, Australia. 14 October 1950. p. 2. Retrieved 24 March 2019 – via National Library of Australia. ^ "Australia Looks First to U.S." The Daily Telegraph. III, (7). New South Wales, Australia. 28 December 1941. p. 1. Retrieved 24 March 2019 – via National Library of Australia. ^ Edwards, Peter. "Another look at Curtin and MacArthur". 2002 History Conference – Remembering 1942. Australian War Memorial. Archived from the original on 17 November 2007. Retrieved 20 August 2014. ^ Day 1999, pp. 522–523, 528, 537; quote on page 540. ^ "Parliamentary Handbook: Constitution – Statute of Westminster Adoption Act 1942". Parliament of Australia. Archived from the original on 20 May 2008. Retrieved 6 May 2008. ^ Hasluck 1970, pp. 32–33. ^ a b Hasluck 1970, pp. 70–71. ^ Wigmore 1957, pp. 383–385. ^ "Singapore was Dunkirk of Australia". The Canberra Times. 16, (4347). Australian Capital Territory, Australia. 17 February 1942. p. 3. Retrieved 24 March 2019 – via National Library of Australia. ^ a b Hasluck 1970, pp. 77–87. ^ Day 1999, pp. 453–454. ^ "Curtin adopts the A.I.F." The Daily Telegraph. VIII, (124). New South Wales, Australia. 13 August 1943. p. 6. Retrieved 24 March 2019 – via National Library of Australia. ^ a b Edwards 2018, p. 18. ^ Edwards 2018, pp. 77–83. ^ Edwards 2018, p. 131. ^ Edwards 2018, pp. 137–140. ^ Gillard, Julia (28 June 2017). "Julia Gillard: the stigma around mental health nearly cost Australia its greatest leader". The Guardian. Retrieved 5 July 2017. ^ Day 1999, pp. 456–58, 468, 480, 520, 538. ^ Coatney, Caryn (November 2013). 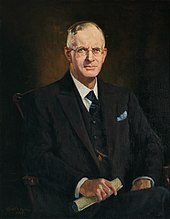 "John Curtin's Forgotten Media Legacy: The Impact of a Wartime Prime Minister on News Management Techniques, 1941–45". Labour History (105): 63–78. ISSN 0023-6942. Retrieved 24 March 2019. ^ Hasluck 1970, pp. 313–314. ^ "Information Regarding Cornwell-Type Claims". Australian Government – Department of Finance. Retrieved 20 August 2014. ^ "Labour Viewpoint". The Canberra Times. National Library of Australia. 25 November 1949. p. 3. Retrieved 20 August 2014. ^ "UNIVERSITIES COMMISSION". Townsville Daily Bulletin. LXV, (36). Queensland, Australia. 11 February 1943. p. 1. Retrieved 24 March 2019 – via National Library of Australia. ^ Daniels, Dale (18 June 2004). "Social Security Payments for the Aged, People with Disabilities and Carers 1909 to 2003 – part 1". Parliament of Australia – Parliamentary Library. Archived from the original on 14 September 2004. Retrieved 20 August 2014. ^ Daniels, Dale (8 November 2004). "Social Security Payments for the Unemployed, the Sick and those in Special Circumstances, 1942 to 2004". Parliament of Australia – Parliamentary Library. Archived from the original on 13 March 2005. Retrieved 20 August 2014. ^ Daniels, Dale (15 October 2004). "Maternity Allowance 1912 to 1978, and 1996 to 2004, Maternity Immunisation Allowance from 1998, Maternity Payment from 2004". Parliament of Australia – Parliamentary Library. Archived from the original on 13 March 2005. Retrieved 20 August 2014. ^ Daniels, Dale (15 October 2004). "Child Endowment 1941 to 1976, Family Allowance 1976 to 1992, Basic Family Payment 1993 to 1995, Family Payment 1996 to 1998, Family Allowance 1998 to 2000 and Family Tax Benefit Part A from 2000". Parliament of Australia – Parliamentary Library. Archived from the original on 13 March 2005. Retrieved 20 August 2014. ^ Daniels, Dale (15 October 2004). "Child's Allowance/Additional Pension or Benefit for Children 1943 to 1993". Parliament of Australia – Parliamentary Library. Archived from the original on 13 March 2005. Retrieved 20 August 2014. ^ Hasluck 1970, pp. 365–370. ^ Hasluck 1970, pp. 535–540. ^ Edwards 2018, pp. 333–334. ^ Edwards 2018, pp. 350–351. ^ "Huge Crowd Pays Homage". The Daily News (City Final ed.). Perth: National Library of Australia. 9 July 1945. p. 8. Retrieved 21 August 2014. ^ Edwards 2018, pp. 404–405. ^ Edwards 2018, pp. 410–411. ^ "London View of Elections". The Advertiser (Adelaide). South Australia. 30 September 1946. p. 4. Retrieved 25 March 2019 – via National Library of Australia. ^ "No title". The Canberra Times. 51, (14, 532). Australian Capital Territory, Australia. 12 November 1976. p. 7. Retrieved 25 March 2019 – via National Library of Australia. ^ MacArthur 1964, p. 258. ^ Goot, Murray (1 October 2007). "Three strikes against the polls, or the Govt is out". ABC News. Retrieved 16 April 2010. ^ Ey, Carol (4 December 2012). "Social security payments for the unemployed, the sick and those in special circumstances, 1942 to 2012: a chronology". Retrieved 21 August 2014. ^ Grattan, Michelle (5 March 2005). "Curtin's Gift". The Age. Melbourne. ^ a b c "Social Services and Immigration". John Curtin Prime Ministerial Library. Retrieved 28 November 2013. ^ a b c Herscovitch, Andrew; Stanton, David (2008). "History of social security in Australia" (PDF). Family Matters. Australian Institute of Family Studies. 80: 51–60. Retrieved 20 August 2014. ^ Alexander, Fred (1967). Australia since federation : a narrative and critical analysis. Nelson. Retrieved 21 August 2014. ^ Daniels, Dale (21 February 2011). "Social security payments for the aged, people with disabilities and carers 1901 to 2010". Parliament of Australia – Parliamentary Library. Retrieved 21 August 2014. ^ "Diary of a Labour Man". John Curtin Prime Ministerial Library. Retrieved 28 November 2013. ^ "Fact sheet – Abolition of the 'White Australia' Policy". Australian Government Department of Home Affairs. Archived from the original on 12 January 2018. Retrieved 11 January 2018. ^ "Bill to Ratify statute". The Age (27, 294). Victoria, Australia. 10 October 1942. p. 2. Retrieved 24 March 2019 – via National Library of Australia. ^ Lee, David (2016). "States rights and AustraliaΓÇÖs adoption of the statute of Westminster, 1931–1942". History Australia. 13 (2): 258–274. doi:10.1080/14490854.2016.1186001. ^ "Pension For PM?". The Daily News (First ed.). Perth: National Library of Australia. 7 July 1945. p. 3. Retrieved 21 August 2014. ^ "John Curtin Prime Ministerial Library". Retrieved 28 November 2013. ^ Black, David. "Biography of John Curtin". John Curtin Prime Ministerial Library. Retrieved 16 March 2019. 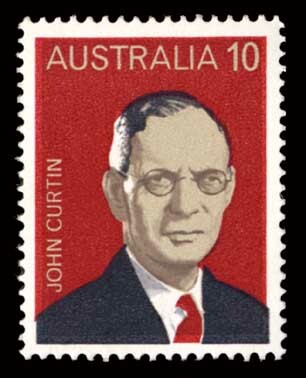 ^ "John Curtin Stamp". Australian Stamp and Coin Company. Retrieved 16 March 2019. ^ "State's tribute to one of the nation's great Prime Ministers" (Press release). Western Australian government. Retrieved 24 March 2019. ^ "Australia Is The Newest Civilization 6 Faction, Led By John Curtin". SegmentNext. 21 February 2017. Retrieved 2 April 2019. Day, David (1999). Curtin: A Life. Pymble, New South Wales: HarperCollins. ISBN 0-207-19669-9. Edwards, John (2017). John Curtin's War - Volume I: The Coming of War in the Pacific, and Reinventing Australia. Viking. ISBN 978-0-670-07347-4. OCLC 1081065848. Edwards, John (2018). John Curtin's War: Volume II - Triumph and Decline. Melbourne, Victoria: Viking. ISBN 978-0-14379-136-2. OCLC 1043833675. Hasluck, Paul (1970). The Government and the People 1942-1945. Canberra: Australian War Memorial. Retrieved 24 March 2019. Wigmore, Lionel (1957). The Japanese Thrust. Canberra: Australian War Memorial. Retrieved 25 March 2019. Black, David (1995). In His Own Words: John Curtin's Speeches and Writings. Perth: Paradigm Books, Curtin University. ISBN 978-1-86342-422-6. Butlin, S.J. and Schedvin, C. B. (1977). War Economy 1942-1945. Canberra: Australian War Memorial. Retrieved 24 March 2018. Dowsing, Irene (1969) Curtin of Australia, Acacia Press, Melbourne. ISBN 91-30-00121-8. Wikimedia Commons has media related to John Curtin.